Visitor Center — The center is the first stop on a visit to West Point. It is open daily from 9 AM - 4:45 PM. It contains many exhibits including a large map that shows the history of the American Revolution. Also in the Visitor Center is a souvenir shop and an information center. Depending on the current US terror alert level, West Point may be closed for visitors or may only be visited by tour buses from the Visitor Center. West Point Museum — The museum is behind the Visitors Center and is open daily from 10:30 AM - 4:15 PM. It contains one of oldest and largest diversified public collections of military artifacts in the Western Hemisphere. The museum is one of the departments of the United States Military Academy and supports cadet academic, military and cultural instruction. Its collections cover all of US military history including many exhibits and displays from the American Revolution. The collection actually began with material brought here after the British defeat at Saratoga in 1777, twenty-five years before the founding of the military academy in 1802. 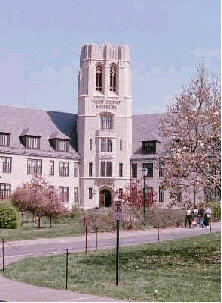 The first floor contains the “West Point” Gallery” and the “History of Warfare” Gallery. The “West Point” Gallery begins with the garrisoning of West Point during the Revolutionary War and chronicles the history of West Point and the academy. Exhibited artifacts include the sword of Polish patriot Thaddeus Kosciuszko, who engineered many of West Point’s early fortifications. The second floor contains the "History of U.S. Army" Gallery and “American Wars” Gallery. The “American Wars” Gallery is dedicated to the sacrifices of American soldiers. 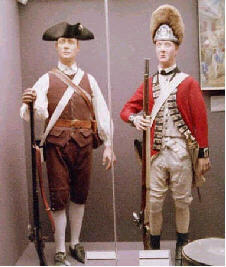 Exhibits from the American Revolution include the British drum surrendered at Saratoga and George Washington’s pistols. 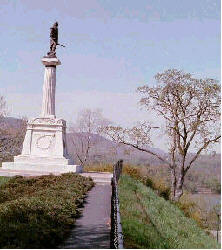 Fort Clinton — At the top of the escarpment near the edge of the West Point Plain is a statue of Thaddeus Kosciuszko. The statue is at the place where a second Fort Clinton was located. There is a Fort Clinton marker in front of the stonewall, just below the Kosciuszko statue. The forts at West Point, which include Fort Clinton and Fort Putnam, were held by the Americans from 1778 to the end of the war in 1783. 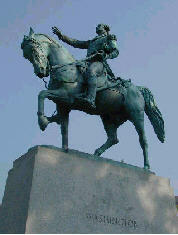 The tribute to Kosciuszko at this position is appropriate since he was the person who engineered Fort Clinton. 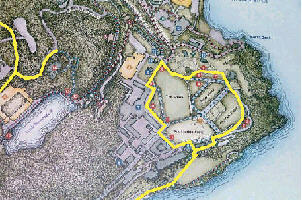 He built this fort at this “west point” along the Hudson and its strategic position is obvious. The fort clearly commands the river, overlooking the entire bend that the river makes around the point. 1746-1817, appointed Engineer-in-Charge of West Point Fortifications by General Washington in 1778. 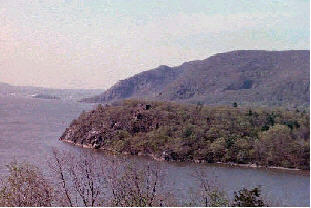 After 1778, the forts at West Point were the southern-most, defensive positions on the Hudson. They were considered very strong and they presented a considerable challenge to the British at New York City. The British were open to other ways of acquiring West Point other than an armed assault and it was Benedict Arnold that would offer one. In the spring of 1779, Benedict Arnold was commander of West Point but it is believed that Arnold was disenchanted with his superiors for their lack of appreciation of his service. He met secretly with the British and offered to sell West Point for 20,000 British pounds. The British were more than willing to negotiate. The matter was given such a high priority that British General Henry Clinton assigned his adjutant general, Colonel John André, to be in charge of the negotiations. On the evening of June 19, 1779, Clinton held a banquet in New York City in anticipation of the conclusion of André’s negotiations and the British acquisition of West Point. At the banquet, André was part of the entertainment, singing a British victory song. A few days later, André would change his tune when, by chance, he was challenged and captured by a small American patrol near Tarrytown, NY. When Arnold heard about the capture of André, he commandeered a barge and its crew. Leaving his wife and child behind, he ordered them to row him out to the British ship, “the Vulture” which was anchored out of range of West Point artillery. Fort Clinton was originally called Fort Arnold, but for obvious reasons, the fort was renamed. The northern edge of The Plain at West Point has displayed captured enemy weapons since the Revolutionary War. In 1778, the Continental Army moved guns captured in the Battle of Saratoga in upstate New York down the Hudson to defend West Point. Washington’s engineer and the designer of West Point’s fortification, Thaddeus Kosciuszko, installed these guns in Fort Clinton at the east edge of The Plain and in the other works ringing the main forts. His statue is located at Fort Clinton, east of Trophy Point. By the end of the war, West Point contained the majority of the Army’s heavy artillery pieces, some 160 guns. At the end of the American Revolution, West Point became the principal repository of guns for the fledgling United States Army. Even before the founding of the Military Academy in 1802, West Point had taken on the additional role of educating officers in the sciences of engineering and gunnery. Captured ordinance naturally became a source of instruction for the cadets to learn how these weapons worked. In 1837, the Military Academy’s Board of Visitors formally recommended West Point as the Army’s site for all trophies of the American Revolution and the War of 1812. The cannon placed at this historic site are trophies of war. They have been captured, surrendered, and brought to West Point for display for over 200 years. As early as 1777, General Henry Knox ordered captured British cannon from the Battle of Saratoga to be brought to “West Point.” Throughout the nineteenth century, other trophies and cannon were placed at this site and are now arranged and grouped by war. These wars shaped the Nation. Beginning at east end of the display is the Revolutionary War area overlooking the Hudson River. Thirteen links of the “Great Chain” that stretched across the Hudson River to Constitution Island during the Revolutionary War is located here. Trophy Point — Just north of the Kosciuszko statue is Trophy Point. The point is a collection of captured artillery, including weapons from the Revolutionary War. Near Trophy Point is an overlook that includes several historical markers. One can imagine the time that West Point Plebes (freshman) have spent at this overlook trying to memorize and absorb the historical facts in front of them. In 1775, the first American patriots occupied Martelaer’s Rock (across the river) and soon renamed it Constitution Island after the British Constitution. In 1775, the Americans built Roman’s battery on the island — still visible at the river-line on the right. 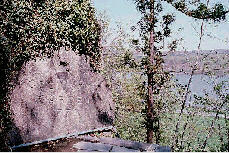 This was the first fortification in the West Point area. By the end of 1776, they also built Marine Battery, Hillcliff battery and Gravel Hill Battery. In 1777, the British destroyed these positions. In 1778 and 1779, the Americans partially rebuilt Marine Battery, completely rebuilt Gravel Hill Battery, and constructed three interior redoubts to protect the river batteries from attack from the north. These fortifications added depth to the West Point defensive zone. Redoubt 7 is visible at the western tip of the island. Redoubt 6 can be seen in the winter on the high ground behind Romans’ Battery. In 1778, the great chain was anchored at Constitution Island in the cove below Marine Battery. The cove is visible to the right of Roman’s Battery. Southwest of Trophy Point is a statue of George Washington on his horse. The statue is in front of the cadet quarters near the main parade ground and the West Point Plain. Its prominent position makes it very clear that West Point attributes its founding to George Washington. George Washington stands above all others as the conceptual founder of the Military Academy. He considered the site of West Point to be so strategic and significant during the American Revolution that he called it the key to the continent. Washington felt that if the British ever commanded the fortifications at West Point they would have a stranglehold on the colonies. He spent a significant portion of his tenure as Commander of the Continental Army at West Point and nearby Newburgh. After the winning of our independence the new federal government acquired West Point in 1790. As President, Washington proposed a national military academy, and several Revolutionary War veterans advocated West Point as the site for such an institution. In his last official letter, written in 1798, Washington wrote that the establishment of a military academy was “an object of primary importance to this country.” In 1802, under President Thomas Jefferson, the United States Military Academy was founded. Kosciuszko’s Garden — Just southeast of the statue and down a stairway between buildings is Kosciuszko’s Garden. Kosciuszko, no doubt, appreciated the natural setting for his garden that was engineered by nature at this small ledge in the escarpment. Built 1778, this garden was constructed as a retreat by Colonel Thaddeus Kosciuszko, Polish patriot, fortifications engineer for the Continental Army 1776-1783, during his tour of duty for the purpose of constructing fortifications at West Point. Fort Putnam — High in the northwest corner of West Point is the restored Fort Putnam. The fort was one of several small forts which were part of a defensive network around West Point. The fort affords a very strategic view of the river, Constitution Island and the West Point Plain. Fort Putnam was one of many forts at West Point during the American Revolution. Built in 1778 by Colonel Rufus Putnam's 5th Massachusetts Regiment, it was the key fortification in the interlocking network of forts and redoubts making up West Point's defenses. From this site, the Plain and approaches to the Great Chain could be protected. Originally a wood and earthen redoubt, Fort Putnam evolved into a stone fortification which stands today after restoration during the American Revolution Bicentennial in the 1970s. Parts of great chain designed to obstruct British navigation of Hudson, 1776-1778, fabricated here during the American Revolution. Home of John Ellison, erected 1754 by William Bull for Col. Thomas Ellison. Used various times between 1779-1783 by General’s Knox, Greene and Gates during the Revolutionary War. Knox's Headquarters State Historic Site, the 1754 John Ellison House, is open Sunday afternoons, June through Labor Day, and at other times by appointment. For most of the 18th century and into the 19th century, the Ellison family milled flour on Silver Stream, which runs behind the house. The flour was shipped down the Hudson River to New York City and the West Indies. 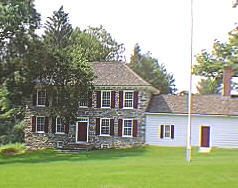 During the Revolutionary War, the house was used as quarters for Major General Henry Knox. Other high-ranking officers, such as Horatio Gates, were also quartered here.